"Celebrate Scottish culture on the grounds of a working farm, and enjoy bagpipe music, Scottish dancing, food, primitive craft demos, vendors, athletic feats, kids activities, costume contests, silent auctions, and much more. Enjoy unique holiday gift shopping and avoid the Black Friday madness! Why this fundraiser? 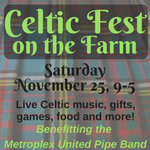 Metroplex United Pipe Band is a non-profit organization that promotes Scottish culture in our community, as well as performing in local parades, concerts, civic events and more. We also compete as a group against other pipe bands from across the country, with the ultimate goal of competing at the World Pipe Band Championships in Glasgow, Scotland. This is the "Olympics" of piping, and the pinnacle of the art. "The Worlds" takes place in August every year, and can be viewed via livestream here in the US. So stirring to watch! The Celtic Fest will raise a portion of the money for the band to actually travel to Scotland, probably in 2019, and represent the USA, and especially North Texas against the best bands in the world. The band hopes to raise $40,000 between now and then to get to Scotland and participate in the week's worth of practices and requisite competitive events. We'd love to take you along, through your participation with us!" Admission Fee: Advance tickets available through Eventbrite.